The GTSOC Pro was designed as a complete tactical package with a Kimber 1911, a Gemtech GM-45 suppressor and an Inforce APL weapon light. 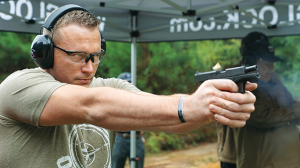 Some of the GTSOC Pro 1911’s upgrades include an accessory rail, a threaded barrel, custom G10 grips and tall, easy-to-acquire Meprolight R4 Evolution sights. The GTSOC Pro ran reliably and was light on recoil while the GM-45 suppressor significantly reduced the sound signature. 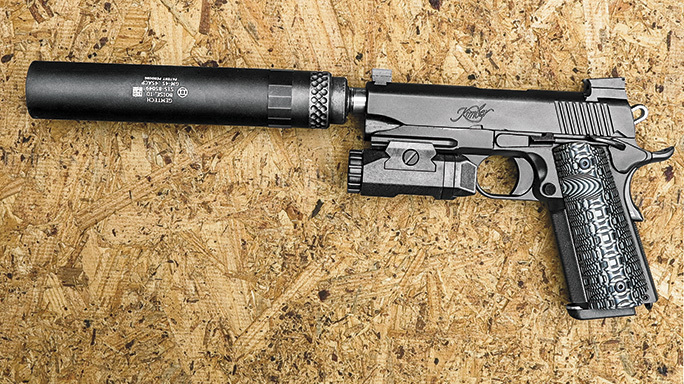 Suppressor makers don’t often come to mind when one thinks of custom firearms, but occasionally they offer specialized, branded versions that are well suited as host weapons for their products in very limited production runs. 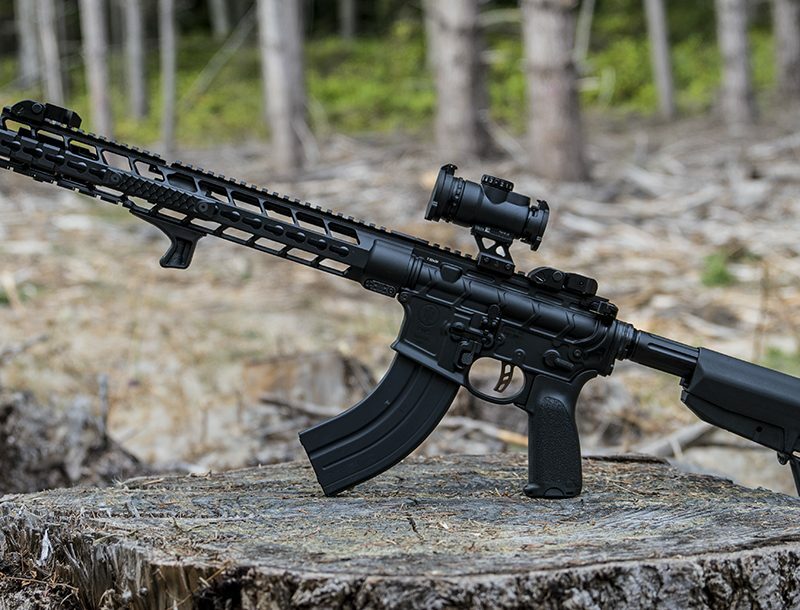 The GTSOC Pro is one of this rare breed and was sold directly by Gemtech of Idaho. The GTSOC Pro starts as a substantially customized pistol but goes further with features specifically requested by Gemtech. 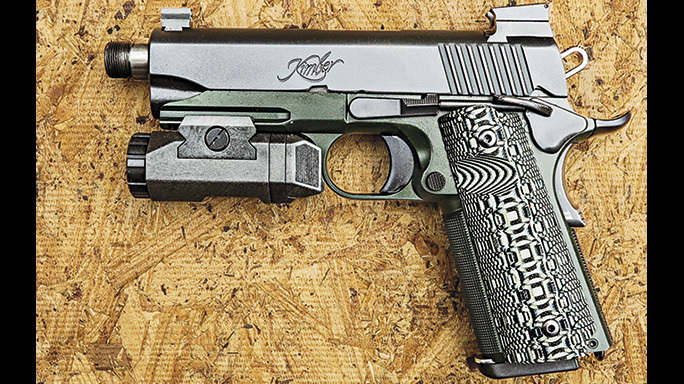 Like all Kimber 1911s, the frame and slide are made from forgings—not cast steel—for strength. The frame is full-sized, but the slide is Commander length to allow about 0.5 inches of the 5-inch, match-grade, stainless steel barrel to be exposed for mounting a suppressor. The GTSOC Pro is replete with features you would expect on a high-end tactical 1911, except for serrations on the front of the slide. These include an ambidextrous safety, 24-lpi checkering on the frontstrap and mainspring housing to give the shooter a secure grip, a Picatinny accessory rail for lights and lasers, and an enlarged magazine release. 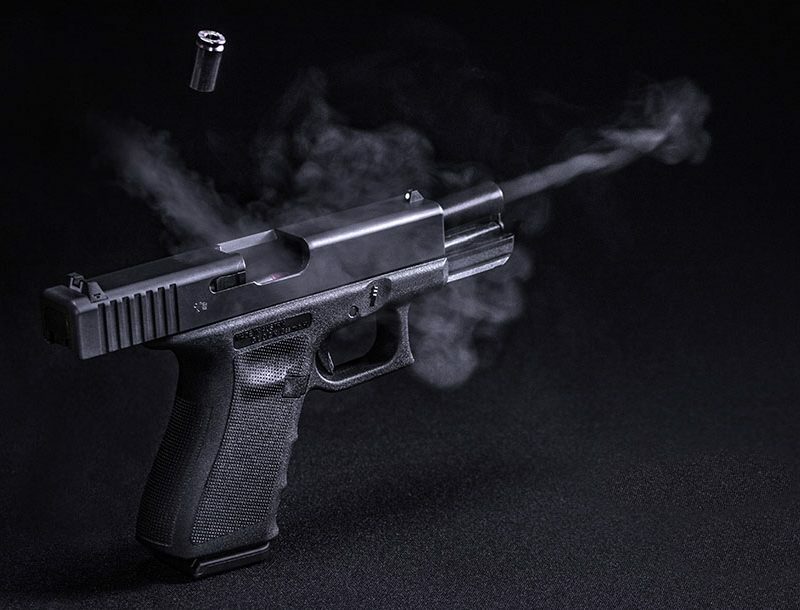 Instead of a traditional barrel bushing, the GTSOC Pro uses a barrel that is flared near the muzzle to mate it tightly with the front of the slide when the pistol is in battery. The 1911 also uses a full-length stainless steel guide rod. The pistol’s grips are made from G10 and engraved with the Gemtech logo. Though the engraving is deeply cut and very functional, the best feature is the scallop cut on the left side, which allows easy access to the magazine release with your thumb. During testing, this allowed me to activate the mag release without having to adjust my grip as I do with most 1911s. That’s a major advantage to combat shooting because you can quickly reload and get back on target with the same firing grip. The 1911 is also equipped with high-profile sights that are a new design from weapons training company R4 Evolution and made by Meprolight. Branded by R4 as the ODS (Optimized Duty Sight), these sights have three rectangular tritium inserts on the rear and a single tritium dot with a small vertical bar below it at the front. Just as unique, the bottom of the sighting notch on the rear sight is wider than the top, which gives the shooter a wider view of the target through the sights. 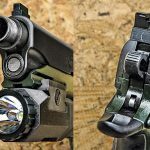 The most noticeable feature of these sights, however, is the sharp, hooked leading edge of the rear sight, which allows shooters to rack the slide by catching the sight onto a belt buckle or other surface if the support hand is injured. This hook is certainly effective for that purpose, but it’s so sharp that you must to wear a glove on your support hand if you’re going to rack the slide using the overhand method. The trigger on the GTSOC Pro is adjustable for overtravel with a setscrew. The trigger broke cleanly at 4 pounds on my test pistol, as measured with a Lyman digital trigger pull gauge, and had absolutely no discernable creep. The GM-45 suppressor is 6.2 inches long, 1.25 inches in diameter and weighs only 5.5 ounces (without the piston) due to its 7075-T6 aluminum construction. It has a Cerakote finish on the outside, and like most Gemtech suppressors, it uses a monocore instead of baffles. Monocore suppressor cores are made by cutting cavities within a single piece of round stock while other designs use individual baffles that are stacked together inside the suppressor’s body. 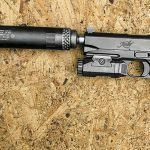 Gemtech rates this suppressor for full-auto fire, and unscrewing the end cap can disassemble the unit. The GM-45 has a stated dry/wet sound reduction of 23/35 decibels. I measured the GTSOC Pro’s accuracy at 25 yards by using a Caldwell rest and three brands of ammunition without the suppressor. The pistol functioned reliably with and without the suppressor. 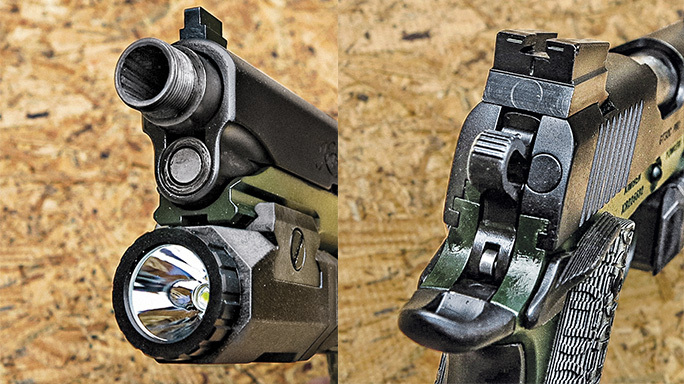 The specialized sights on the GTSOC Pro worked best for night fire due to the shape of the tritium vials, which clearly indicate where the front sight is in relation the rear. However, the multiple tritium vials could be distracting in daylight, though the shape of the rear sight notch is advantageous because it shows more of the target downrange. Velocities typically increase when using a suppressor due to the action of the expanding gas pushing the bullet forward without frictional losses from contact with the barrel. Adding the GM-45 suppressor increased velocities on average by 31, 79 and 49 fps for the Black Hills, Freedom Munitions and Winchester loads, respectively. Muzzle flash was also undetectable to the eye using the suppressor with these loads. The suppressor had the occasional first-round “pop,” which is a louder-than-normal report due to the unit containing oxygen before it gets depleted from subsequent rounds. The GTSOC Pro handled very well with or without the lightweight suppressor attached. Magazine changes were easy and quick due to the pistol’s grips and large magazine release as well as the bumper pads on magazines, which made seating reliable. Also, the pistol’s long safety levers were easy to work even when wearing gloves. 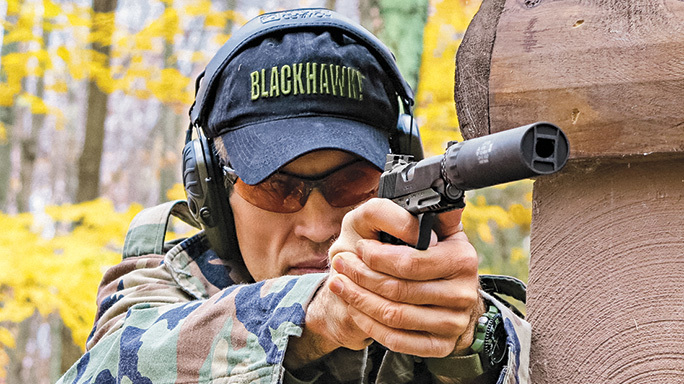 Customized pistols with special branding and features for suppressor companies are not new to the market, but they are seldom offered and potentially collectible. 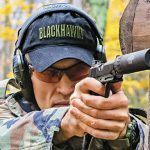 The GTSOC Pro, however, offers a lot more than collector appeal—it’s a serious 1911 with tactically relevant custom features and high-quality accessories that work well together as a unit. And since this writing, TW has learned that the GTSOC Pro packages have already sold out, but we’ll keep you posted as to when Gemtech and Kimber come out with another special run. 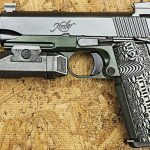 In the meantime, you can look to Kimber’s “new for 2016” Custom TLE II TFS and Custom TLE/RL II TFS 1911s, which are ready for covert operations.